ProTactic II - Mission, Critical, Access! Adjustable interior dividers for snug, secure fit and easy customization. 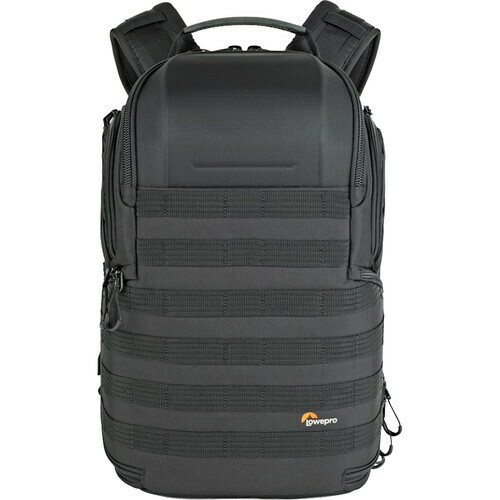 Box Dimensions (LxWxH) 19.0 x 17.0 x 12.0"
ProTactic BP 350 AW II Camera and Laptop Backpack (Black) is rated 3.2 out of 5 by 11. Rated 3 out of 5 by Cengiz from Too heavy for a smallish bag This is not a very large bag and the items in the photos will fit very snuggly into it. However it is a heavy bag for its size. Although it is made of high quality material I wouldnt want to carry additional 2.2 kg on top of my camera gear. Someone getting this medium sized bag is probably trying to keep the weight down, which this bag is not helping. Also, for some reason someone in lowepro or in B&H decided to use almost same set of advert pictures for 350AW and 450AW. So people who are buying this bag by looking at pictures here, most of which are of 450AW, are feeling deceived when they get their bags. Rated 3 out of 5 by Nicolas from Great but too small Quality is great, its comfortable to carry around BUT... too small. I own a 5D mk IV with grip. During selection I used the compatible with 1Dx feature of the website. I think its size is similar to my setup, and this bag was listed as compatible, but it wont fit. Rated 2 out of 5 by Alexander from Beware of the pictures in this item If you planning to buy the lowepro protactic bp 350 aw, think twice and read all reviews, I read the reviews and still decided to give it a try, the backpack is very very small, the pics in the item are mixed, some pics are for the 450 and some are for the 350 so you cannot rely in the pics only, read the specs where the measures are detailed. I bought based on the pics and the specs, and I ended up paying the shipping back to B&H, even though they have the pics mixed. I have the 450 already and its really good, but the 350 is extremely small, I spent hours trying to fit a Sony camera with one lens attached plus a Mavic 2 Pro, impossible to arrange the pads to my needs. Rated 1 out of 5 by Kenneth from Really Disappointed! In my opinion Lowepro has declined in their design and ergonomics skills. 1. The dividers included with the backpack do not allow you to utilize all of the space in the bag. I had to grab dividers from old Lowepro bags to accommodate my equipment. 2. They include attachable pouches. However, the pouches cant be attached the the side of the bag anywhere only the front of it. If you have to lay the bag down to open it, you have to lay it down on the attached pouches. Thats just a bad design. What were they thinking? I have a backpack purchased from Lowepro over 15 years ago. I thought I was getting an upgrade, but I didnt. They should get back to the basics of efficiency, organization and ergonomics. Shame on them. It seems they changed a design just for the sake of saying they had a new product. I returned this product. Rated 4 out of 5 by fabien from realy small... i juste receive my Backpack.... if you look the picture from BH web ... look big than reality... probaly the man on picture are small not more than 56 or 57 the 2 belt chest and waist are for women or small man... 511 and 32 / 34 waist you need to take this belt off and change the belt.. i do . the backpack are ok... but look for the size on the tecnical chart if you look the photo on the web ... the man are probably a small one size ... not more than 56 or 57 150 pound because the backpack look big and it is a small one ..but a good one. Rated 3 out of 5 by Patrick from size is disappointing compared to 350i I had a few of the 350i bags and absolutely loved them. The size was perfect for my typical walk-about kit (7dii + 16-35 + 100-400) and a few extras. A few of the main complaints I had with the 350i were down to the shoulder straps being a bit uncomfortable by the end of the day, the top access being hard to open and overly terribly shaped for what it was trying to offer, and the size of the external side pockets. I picked up the 450ii for a bigger bag and loved how series 2 addressed these issues; especially the shoulder straps which are amazing now. I loved it so much I decided to shell out for the upgrade to the 350ii to use as my everyday carry. The bag is great, but do make sure you check the dimensions. The 350ii is in reality much smaller than the 350i, and I think thats to bridge the gap between the 250i which they didnt rerelease in series 2. The result is a very compact bag which is fantastic quality but is going to be uncomfortably tight for anyone accustomed to the first series. You are unlikely to manage a gripped dlsr in the bag let alone have it accessible from the top and side access points. Overall, i can carry my 7dii with 100-400 with hood in shooting position and get it in and out of the top access easy enough so it IS great for my purposes, but Im extremely disappointed that Lowepro chose to downsize the 350ii to accomodate the 250i niche it left behind. Yet again in life I am sadly reminded that just 4cm of extra depth actually makes a significant difference. Rated 4 out of 5 by J A from For my daughter This was purchased for my daughter and she uses it all the time. This pack can hold a number of items besides the camera and lenses. Can you squeeze a 15&quot; Macbook Pro in the 13&quot; laptop area? 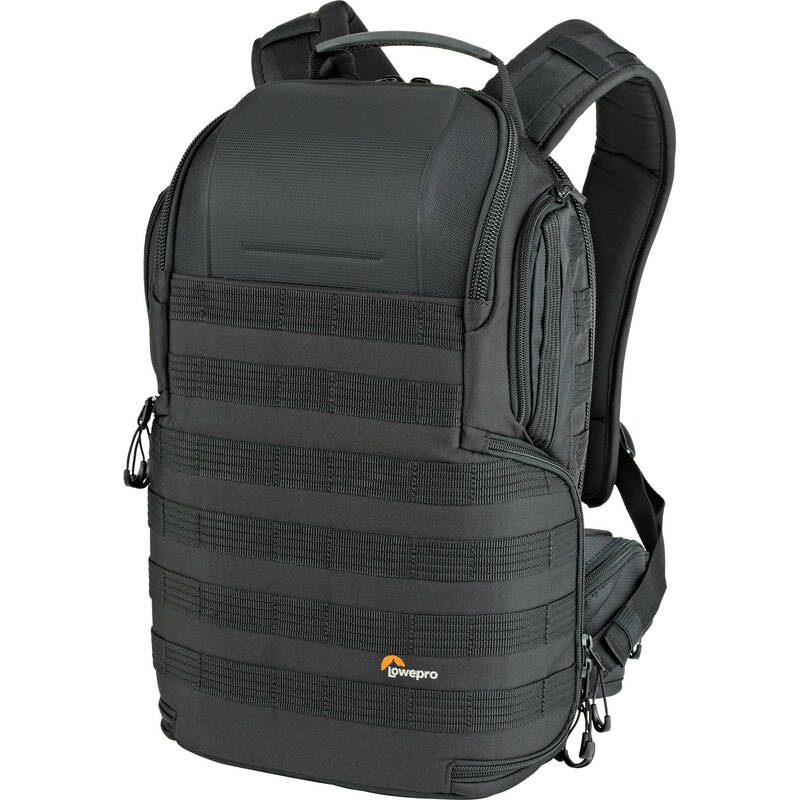 It is not recommended to attempt to place a 15&quot; MacBook Pro into the 13&quot; laptop compartment on the Lowepro ProTactic BP 350 AW II Camera and Laptop Backpack (Black), B&amp;H # LOPT350. The dimensions for the laptop compartment are 9.45 x 0.71 x 13.58 in. While the MacBook Pro with the Retina screen may be slightly smaller than the standard MacBook Pro, it would still be difficult to insert and remove the larger laptop from the laptop compartment designed for 13&quot; laptop's ease-of-use. Does the 350AW II meet international airline carry-on requirements? The size is fine if you plan on using overhead storage. Be very careful about the weight limitations. This bag is heavy to start with. A Pro body or two, and pro level lenses can quickly put you over the weight limits, especially if you are flying on one of the new Economy Airlines that weigh everything. What are the dimensions of the opening on the side? I'm trying to determine if I can get a D850 with a grip in and out of the side easily. What are the labels (i.e., Length, Width and Height) for the dimensions provided? Do straps have more comfort than the previous model of this backpack? Can this model fit a Nikon D850 + 24-70f/2.8 + 70-200f/2.8?